As one of the world’s most ancient and beloved games, chess holds a special place in the hearts and minds of its players. Its rich history and ability to capture the interest and intellect of such a wide range of people is unmatched. The wide range of chess sets available further speak to the artistic aspect of the game as its players covet the beauty of the board and pieces as much as they do the actual game. From chess sets that convey famous battles or historic periods to giant sets that can be played outdoors and vertical sets that can be mounted on the wall, the wealth of options available is more than impressive. To help you decide on your first or next chess purchase, this compilation of the top 10 online chess stores should guide your decision. If you are looking for a plethora of chess sets and accessories to choose from, Chess House is for you. Under their chess set drop-down menu, the options are numerous: wooden chess sets, giant chess sets, theme chess sets, electronic chess computers, club chess sets, heirloom chess sets, chess set combos, travel chess sets, and chess sets with storage. For the budget-friendly shopper, there are even subsections for the top chess sets under $50 and the top chess sets from $50 to $150. Their chess set pieces section also has a wide variety of materials and styles to choose from: wooden, plastic, themed, metal, luxury, silicone, pieces with a box, club and tournament, and single and replacement pieces. The Chess House website features a user-friendly design that is clear and easy to navigate. The subsections and drop-down menus make it a cinch to find precisely what you are looking for. Their options are also truly impressive and ensure that even the most discerning of shoppers will find exactly what they are looking for. The Chess House name is synonymous with unique selection, safe packaging for worldwide shipping, a 100-percent satisfaction guarantee, and simple replacement parts. With such a wide variety of chess sets available, there is also a wide variance of price points. Their club sets, travel chess sets, and theme sets are their most popular items and range in price from $50 to $300, the median price falling in at around $100 for premium-quality sets. Most chess enthusiasts are familiar with the House of Staunton brand known for manufacturing and supplying the world with the finest-quality chess boards and pieces. The House of Staunton name reflects the popular Staunton chess board pattern, one that is as popular today as it was when first introduced 150 years ago. If you are looking for a classic chess set, the House of Staunton site has a number to choose from. Their shopping sections are organized into menu options that are easy to understand and navigate: chess pieces, wood chess pieces, luxury chess pieces, luxury chess sets, wood chess sets, themed chess sets, bone chess pieces, plastic chess sets, chess boxes, plastic chess pieces, themed chess pieces, luxury wood chess boards, wood chess boards, chess boards, chess clocks, chess bags, tournament chess sets, chess books, chess software, and chess DVDs. House of Staunton is not just known for its chess sets, but also the vast array of accessories that are also available. The House of Staunton is one of the leading suppliers of chess tournaments, and those that are serious about the game are familiar with their products and reputation. Their chess sets range in price from $100 to over $600, with the most average pricing falling in at around $130. Some of their most popular items include the House of Staunton tournament combo and the classic Staunton-patterned chess board sets. As the name suggests, Mega Chess specializes in giant chess sets that are increasing in popularity. Giant chess sets have become a staple of outdoor public spaces, libraries, community centres, homes, schools, and special events. Companies have even caught on to the benefits of having a giant chess set available for staff to play on during breaks as the game provides mental stimulation and improves focus. Mega Chess offers a wide variety of giant chess sets that differ in size, material, and style. The larger the pieces, the harder they are to move, making them more appropriate for adults. There are also smaller pieces or lighter ones that are ideal for players of all ages. The giant chess set pieces range in size from 8″ to 49″. For the sets designed for outdoor and indoor use, they are made from the sturdiest of outdoor materials to avoid cracking, chipping, and fading. 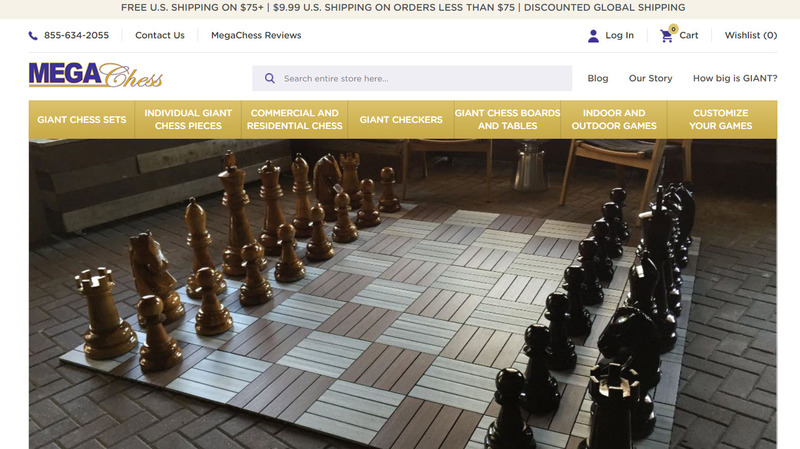 Those shopping for a giant chess set will not be disappointed with a visit to the Mega Chess website. Chess sets can easily be ordered from the user-friendly site, and shopping is a breeze with their clearly marked subsections covering size, material, use, and style. As gigantism is their speciality, you are sure to find the perfect giant chess set to meet and exceed all of your needs and expectations. The Mega Chess best sellers include the Mega Chess 25″ plastic giant chess set and the Mega Chess giant plastic LED chess set. The latter glows in the dark and is available in a number of colours, making this set an appealing way for children to be introduced to the game. The giant Mega Chess chess sets range in price from $399 to $5,000. The average Mega Chess chess set pricing falls at around $600 for a durable and resilient chess experience. The Chess Store specializes in chess products from around the world. With a simple menu featuring categories of chess sets, chess pieces, chess boards, chess clocks, club and school supplies, chess storage, books and DVDS, online shoppers can easily find what they are looking for. In business since 1999, the Chess Store is the world’s leading chess retailer. They are known for their superior customer service and their fine Staunton wood chess sets. 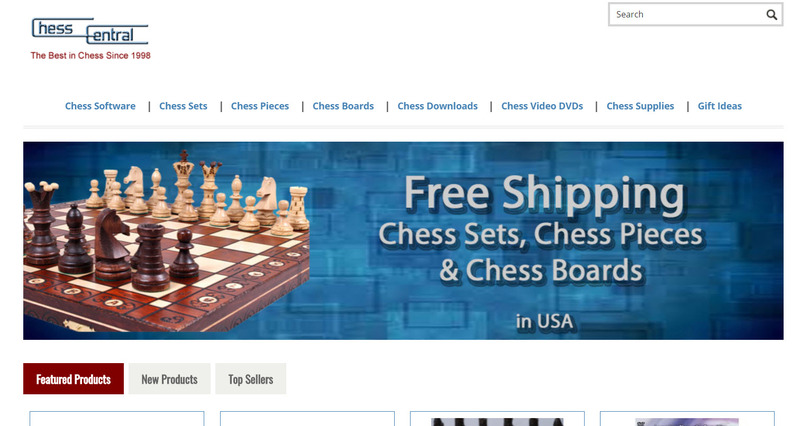 The Chess Store offers free shipping on orders over $75 US and discounted shipping rates for orders under $75. The Chess Store is known to ship their products quickly and safely with ample protective packaging. The Chess Store sets feature some of the finest wood Staunton pieces and sets, and they have a wide variety of Staunton chess sets with storage, which are their most popular sellers. The Chess Store features a wide array of chess sets ranging in price from $100 all the way up to $4,000. A person can easily purchase a high-quality chess set with a storage box from the Chess Store for $150, the average price. As America’s largest chess store, there is little doubt you will find everything you need and more when you visit the ChessUSA website for some online shopping fun. Having been in operation since 1978, during that time, ChessUSA has embraced the evolution of the game and developed new boards, pieces, and sets to satisfy the changing needs and expectations of the global chess community. 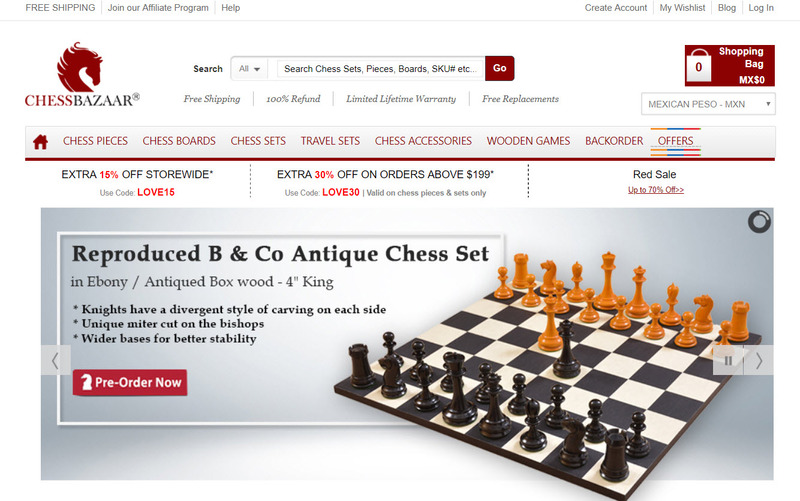 ChessUSA features easy categories to help online shoppers find exactly what they need: chess sets, Staunton pieces, themed sets, chess boards, tournament supplies, computers, software and books, and sale items. ChessUSA did not become the nation’s largest chess store by accident; they have evolved alongside the growth of the game and developed a number of sets, boards, and accessories that their customers can enjoy for years to come. The ChessUSA site’s most popular item is their heritage chess sets that range in price from $170 to $1,000. Chess Central has been in business since 1998, and in that time, they have cultivated long-term relationships with chess fans who look to them for the latest and greatest developments in the chess set industry. They offer their American customers free shipping and have easy categories of chess software, chess sets, chess pieces, chess boards, and chess DVDs. Chess Central has earned themselves a solid industry reputation based on customer service, excellent shipping options, and high-quality products. Chess Central’s most popular chess set is the Zaria set with storage. Chess Central chess set prices range from $50 to $500. The Chess Central sets are a great bang for your buck as their affordable prices still produce top-notch sets. Chess Baron is known for its affordable pricing and Staunton chess sets. They offer free delivery in the United States and have a fine selection easily scrolled through on their website. The shopping categories are easy to navigate through: luxury chess, mid-price, chess, economy chess, travel and magnetic, marble chess, themed sets, chess for the blind, and chess computers. With many of their sections differentiated by price, this site is ideal for those on a budget. Chess Baron’s biggest sellers are their hand-carved Staunton chess sets. Their chess set pricing ranges from $24 to $500, with an average Chess Baron set purchasable for less than $100. Chess Bazaar offers free shipping within the US, 100-percent refunds, limited lifetime warranties, and free piece replacement. 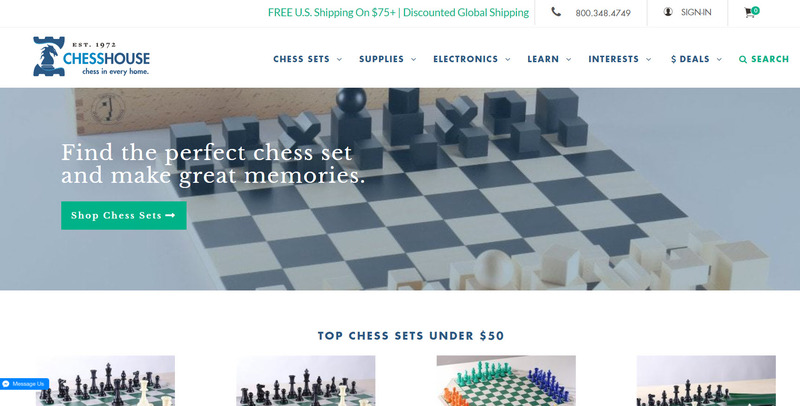 Their site is easy to navigate and features sales categories and ‘the best of’ last year’s chess sets. Their shopping categories include chess pieces, chess boards, chess sets, travel sets, chess accessories, and wooden games. They also have a special ‘offers’ section for the budget-savvy shopper. Their reproduction chess sets are among their best sellers, including a vintage German 1930 knubbel chess set. They also offer the service of ordering custom-made chess sets. The Chess Bazaar sets range in price from $200 t0 $1,000, with many averaging a price of $250 for a premium-quality chess set. Chess Warehouse is all about the love of the game and the artistry of the sets. Their menu is clearly accessible and features the categories of best sellers, chess sets, chess pieces, chess boards, and accessories. Their chess sets are available in metal, alabaster, and wood. The Chess Warehouse team understands that the game is not just about the playing, but also the admiration of it, which is why their sets are as lovely to look at as they are stimulating to play. Their top sellers include their metal chess sets and the Rosewood Pro. 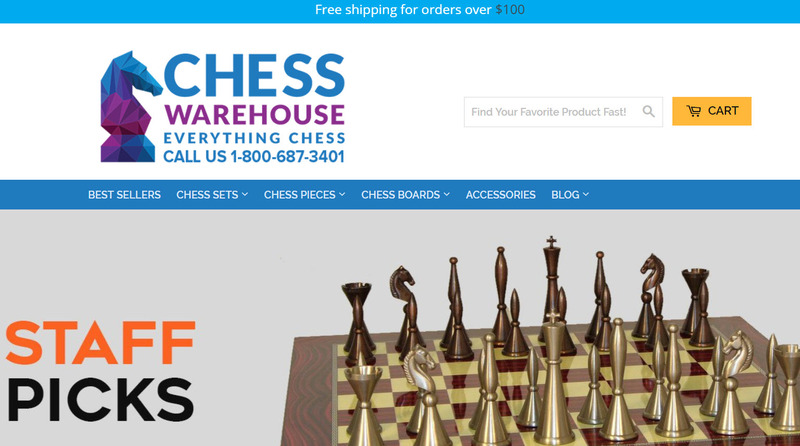 Chess Warehouse is ideal for those on a budget as their sets range from $200 to $500, meaning that one can purchase a high-quality and durable set that will last a lifetime for as little as $200. 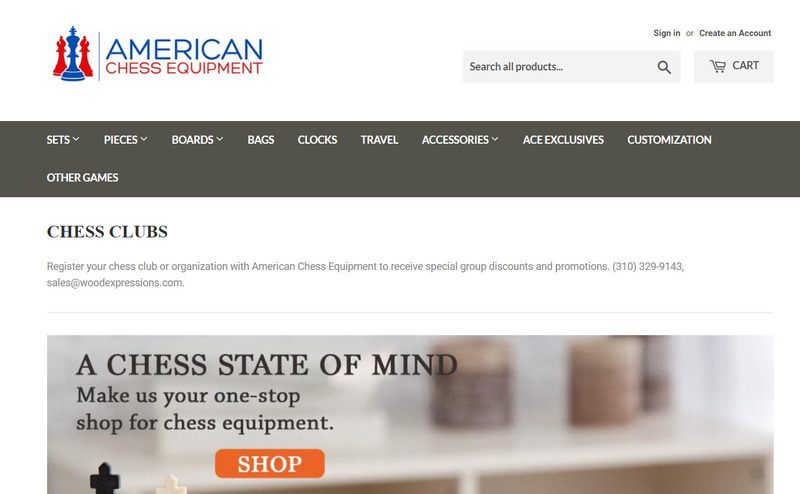 American chess equipment is known as a one-stop-shopping experience to meet all your chess needs. They offer a wide range of chess set styles and options as their shopping categories include sets, pieces, boards, bags, clocks, travel, and accessories. Having been in business since 1986, American Chess Equipment is proud to have been serving the nation’s chess community for almost 40 years. 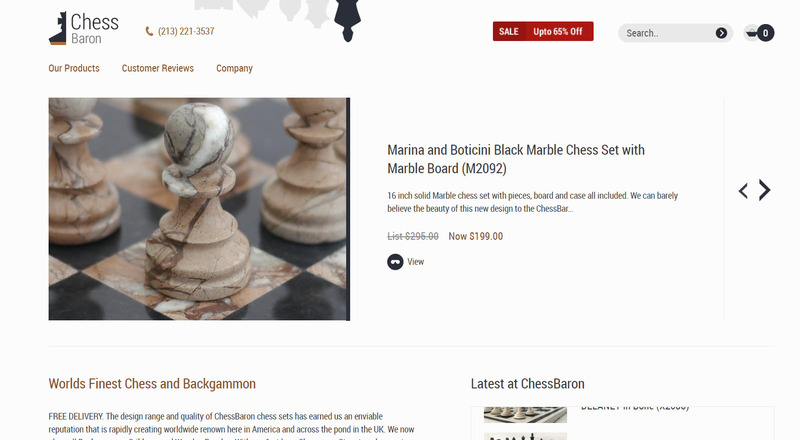 In that time, they have earned their industry reputation as a top online chess retailer and an enjoyable and efficient one-stop shopping experience. They also offer the service of customizing boards with special logos or brands. Their French Staunton and tournament sets are among their most popular sellers with their portable tournament chess pack often selling out. Ranging in price from $30 to $1,500, American Chess Equipment has a set to suit every budget. When it’s time for you to invest in a new chess set, whether it’s your first, or one of many, these top 10 chess stores are excellent options to choose from. Not only do they have solid reputations for fine quality and customer service, they have endless varieties to choose from with many price points.